Globular clusters – dazzling agglomerations of up to a million ancient stars – are among the oldest objects in the universe. Though plentiful in and around many galaxies, newborn examples are vanishingly rare and the conditions necessary to create new ones have never been detected, until astronomers using the Atacama Large Millimeter/submillimeter Array (ALMA) have discovered what may be the first known example of a globular cluster about to be born: an incredibly massive, extremely dense, yet star-free cloud of molecular gas. 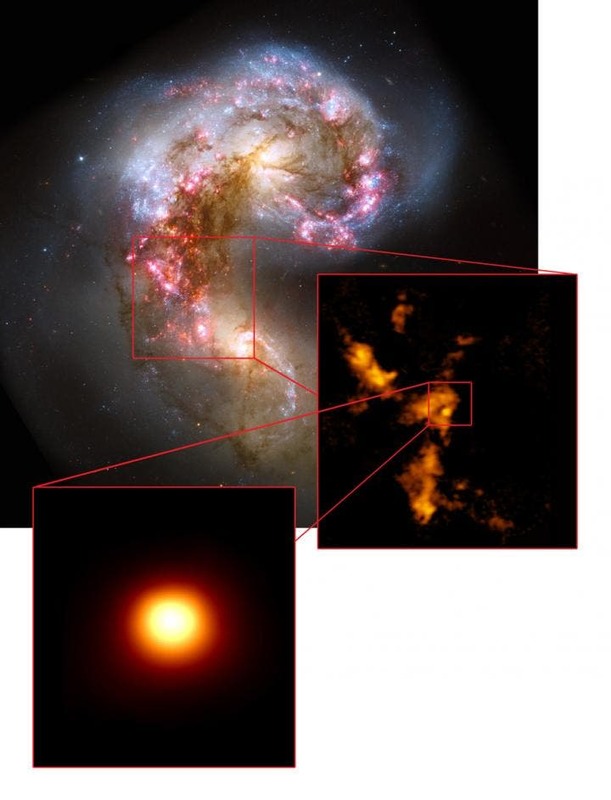 "We may be witnessing one of the most ancient and extreme modes of star formation in the universe," said Kelsey Johnson, an astronomer at the University of Virginia in Charlottesville and lead author on a paper accepted for publication in the Astrophysical Journal. "This remarkable object looks like it was plucked straight out of the very early universe. To discover something that has all the characteristics of a globular cluster, yet has not begun making stars, is like finding a dinosaur egg that's about to hatch." The Antennae galaxies, shown below in visible light in a Hubble image (upper image), were studied with ALMA, revealing extensive clouds of molecular gas (center right image). One cloud (bottom image) is incredibly dense and massive, yet apparently star free, suggesting it is the first example of a prenatal globular cluster ever identified. The ALMA image at the top of the page shows the dense cores of molecular gas in the Antennae galaxies. The round yellow object near the center may be the first prenatal example of a globular cluster ever identified. It is surrounded by a giant molecular cloud. This object, which the astronomers playfully refer to as the "Firecracker," is located approximately 50 million light-years away from Earth nestled inside a famous pair of interacting galaxies (NGC 4038 and NGC 4039), which are collectively known as the Antennae galaxies. 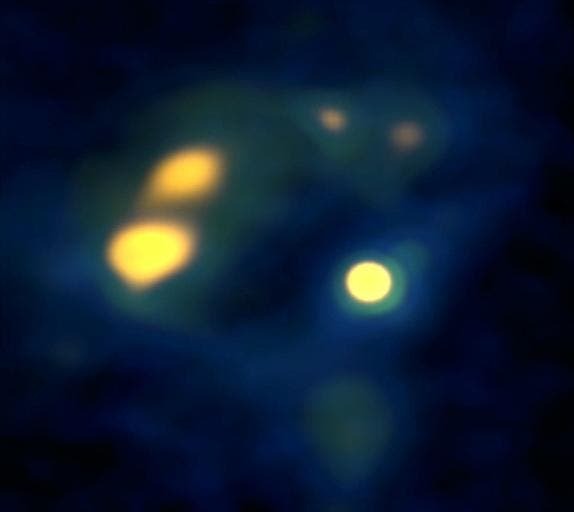 The tidal forces generated by their ongoing merger are triggering star formation on a colossal scale, much of it occurring inside dense clusters. "Until now, clouds with this potential have only been seen as teenagers, after star formation had begun," said Johnson. "That meant that the nursery had already been disturbed. To understand how a globular cluster forms, you need to see its true beginnings." Most globular clusters formed during a veritable "baby boom" around 12 billion years ago, at a time when galaxies first assembled. Each contains as many as a million densely packed "second generation" stars: stars with conspicuously low concentrations of heavy metals, indicating they formed very early in the history of the universe. Our own Milky Way is known to have at least 150 such clusters, though it may have many more. Throughout the universe, star clusters of various sizes are still forming to this day. It's possible, though increasingly rare, that the largest and densest of these will go on to become globular clusters. "The survival rate for a massive young star cluster to remain intact is very low – around one percent," said Johnson. "Various external and internal forces pull these objects apart, either forming open clusters like the Pleiades or completely disintegrating to become part of a galaxy's halo." "Water May Have Been Abundant in First Billion Years After the Big Bang"
A Universe Fine-Tuned for Life? –"Protosuns Found Teeming with Prebiotic Molecules"